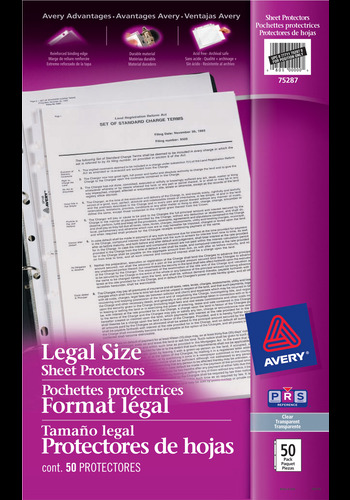 Protect important legal-sized pages and keep them safe with Avery® Heavy Duty Legal Size Sheet Protectors. These 8-1/2" x 14" sheet protectors are 7-holed punched and are ideal for use in legal-size binders. Made of a sturdy Heavy Duty Vinyl, these sheet protectors provide durable protection against damage from frequent handling. Protect important legal-sized pages and keep them safe with Avery® Heavy Duty Legal Size Sheet Protectors. These 8-1/2" x 14" sheet protectors are 7-holed punched and are ideal for use in legal-size binders. Made of a sturdy Heavy Duty Vinyl, these sheet protectors provide durable protection against damage from frequent handling, so you can refer to documents again and again. The Reinforced Binding Edge anchors the protector in your binder to resist tearing, so your documents enjoy lasting protection, and you enjoy increased peace of mind. The sheet protectors' binding edge is reinforced to ensure protectors don't rip or tear in the binder rings and that documents stay protected. Sturdy vinyl sheet protectors provide heavy duty protection against damage from frequent handling. Easily refer to protected documents with confidence. Showcase projects, portfolios and proposals.